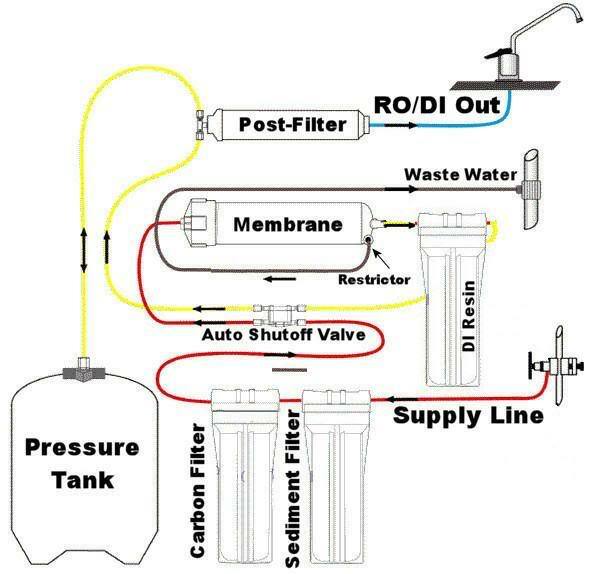 I have a reverse osmosis water filter in my kitchen connected to a remineralisation filter for drinking and wondered if this would be ok for water changes with a marine tank. It’s a five stage unit (6 with remineralisation) but doesn’t have the de-ionisation element and was wondering if DI water is a must in marine tanks. DI is a must. It's what gets it down from low to zero TDS. Ok thanks so you know if it’s simple to add a DI filter to your machine . My remineralisation filter was just added on before the faucet tap but not sure if I can do that with a DI filter or does it have to go via a waste pipe first. Thanks for the pic - need to work out a way of adding a DI stage onto the existing system then. Space is a little tight under sink by the time I have faffed around with the plumbing of adding another stage I may have just bought another unit for a fish tank . I add the remineralisation filter at the end of the water as imo it tastes too pure and i think it’s acidic as all the minerals are taken out. I also read it’s not good to drink too much RO water due to no minerals. Also can you recommend a water testing kit ? I’m trying to get the water quality sorted out first before getting a tank. You can buy in-line TDS meters for the RODI system, and a pressure guage. Loads of places sell these, but I've always used Vyair, as their customer support is excellent. If you mean test kits for ammonia, nitrite, nitrate, phosphate, cal, kh, mg, etc. then RedSea is a good brand, or Salifert, or Colombo. For Phosphate I like RedSea, but there's lots of comparisons and reviews on here if you have a search, or look in the Chemistry board. Ok thanks a lot for the recommendations and help with this . I don’t think it will be too much of an issue to add the DI stage to my setup with valves diverting it away from the remin filter for water changes. Will have a look into the TDS meter - that’s just what I need I.e an instantaneous readout of water quality. Is a pressure gauge really needed as I have an electrical pumped unit already. A lot of people don't have one, but it makes sense to me. Water changes Yes or No?